Did you know that despite the fact that scuba diving is considered to be one of the most dangerous activities in the world, millions of people get scuba diving certifications every ear? With the growing number of scuba divers, the scuba diving industry, which is currently a multi-billion dollar industry, is likely to reach the billion-dollar mark. The level of danger associated with scuba diving can be used to explain why this activity is so popular. The adrenalin rush you get while at it is just something else. Apart from the usual day scuba dive, have you considered night scuba dive? A night scuba dive is very different from the day scuba dive because the underwater scene is very different at night. If you have not made up your mind yet about engaging in night scuba dive, below are some of the advantages of night scuba dive you need to consider. Scuba diving at night gives you the chance to enjoy the dive without many distractions from beach goers, snorkelers and surfers. You get to have the waters all by yourself. With the less distraction, you can fully explore the marine life. So many marine lives hide during the day and only come out at night. These include the octopus, eels and lobsters. Besides coming out at night to swim, these creatures engage in various behaviors, which is amazing to watch. Besides these amazing creatures, there are many other good things to see at night. In addition, the behavior of the other day creatures change once it gets dark. The way these creatures behave during the night is not similar to the way they behave at night. One amazing thing about marine life is bioluminescence. Bioluminescence happens when a living organism produces and emits light. This stunning phenomenon can only be experienced during a night scuba dive. The tiny plankton organisms found underwater give off the light when they are in motion. There is so much to see at night that you do not even have to swim so far to encounter stunning marine life. At night there are less man made sounds due to the fact that there is less distractions at night. With the calm and quite of the night, you get to experience very different sounds. In addition to clear sounds, the vision is also amazing at night especially if you have a good light during a night dive. The use of white flashlights, whether LED or HID gives you the opportunity to see the actual colors of the marine life. Besides, there is no light coming from outside to interfere with the real colors hence you get to be in a world full of real colors. If you take the dive with your buddy (which always is recommended), you are at a better place to come to their aid or vice versa, in case of an emergency because you are able to see each other’s lights. In case of an emergency, you or your dive partner can simply shake the lights to signify the need for help. You cannot miss the lights so you are able to get quick assistance during the night as compared to the day. 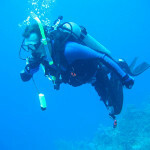 Having looked at the advantages of night diving, it is clear that night scuba diving is so much fun. However, the increased fun and adventure also comes with its own share of danger. Therefore, if you are planning to go for a night scuba dive, there are certain precautions that you have to consider first. Below are some of the precautions. When diving at night, it is safer for you to take shallower dives compared to the dives you take during the day. This is because, navigating at night is not easy as during the day. For instance, you may find it hard to detect a sloping bottom at night. Also, remember to go really slow to avoid any unpleasant surprises. The spot you choose for the night scuba dive has to one that is easily accessible in the dark. This will ensure that you promptly get the assistance you need in case of any mishaps. 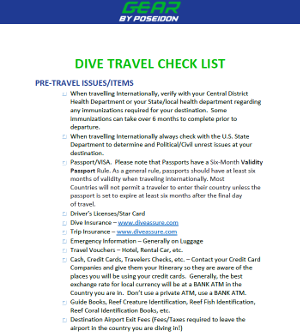 In addition, the site with an easy entry and exit is recommended especially if you have to take your dive equipment with you in the water. Not only is a familiar site easy to navigate, you also get to see the changes that occur in the marine life at night. If you dived in the site during the day, diving in the same site at night gives you the opportunity to have a complete experience of the marine life. Marine life undergoes massive changes from day to night so scuba diving at night in the same site you scuba dived during the day gives you the chance to experience the massive changes. Furthermore, if it is your first time to scuba dive at night, then you definitely have to consider a familiar site first before exploring new sites. 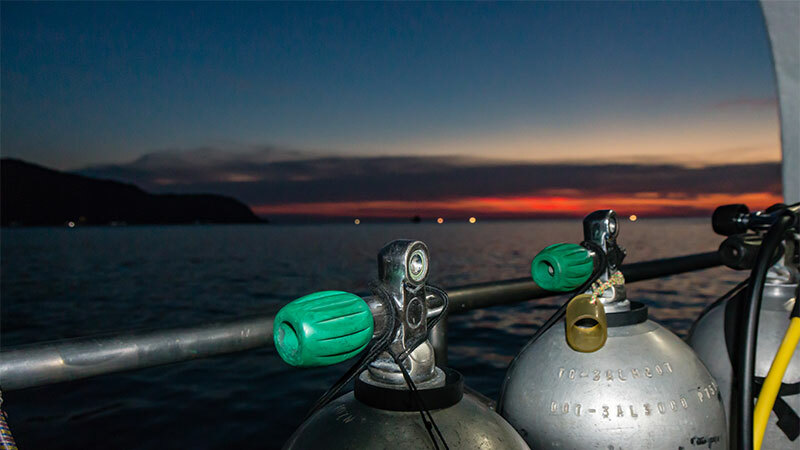 When choosing the site to undertake the night scuba dive, it is advisable to pick a site with as little current as possible so that you can be in control while underwater. If the site has very strong currents, you will be concentrating on controlling yourself rather than enjoying the experience of the night dive. As mentioned, it is not entirely safe to be underwater at night so you definitely need to be alert while underwater. Regardless of your physical ability, strong currents can ruin your experience so it is best to pick a site with minimal currents. In order to get the full picture of the marine life, you need to have a look at it over an entire day. If you have scuba dived during the day, you need to experience the marine life at night too. The good thing is that even if you have not scuba dived before, you can accomplish both day and night scuba dive in one day. Alternatively, you can start with a night scuba dive just be ready for the amazingly beautiful marine life that awaits you.